What would a gyro be without the tasty tzatziki sauce? Discover how easy it is to make a creamy bowl of tzatziki with authentic ingredients. It has all the comforting texture and flavor you crave and it is easy to make. Use it to top your gyros or as a yummy dip for pita wedges and vegetables. RecipeSavants.com What would a gyro be without the tasty tzatziki sauce? 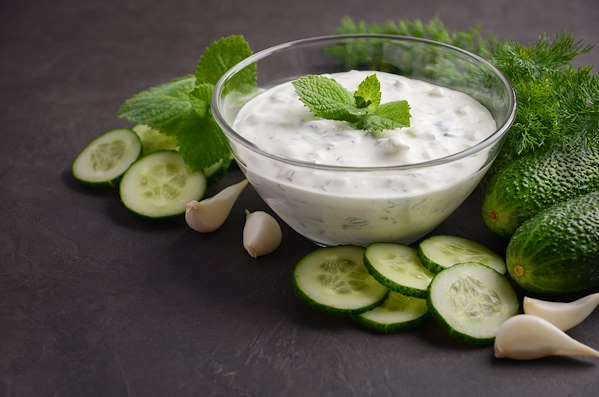 Discover how easy it is to make a creamy bowl of tzatziki with authentic ingredients. It has all the comforting texture and flavor you crave and it is easy to make. Use it to top your gyros or as a yummy dip for pita wedges and vegetables. Smart Recipes, Mediterranean Recipes, Dairy,Vegetables Recipes, Recipes Dairy,Vegetables Mediterranean Authentic Tzatziki Sauce PT10M Serves 4 Ingredients: 0.5 Large Seedless Cucumber 1.5 Cups Greek Yogurt 2 Cloves Garlic 3 Tablespoons Extra-Virgin Olive Oil 1 Tablespoon White Vinegar 0.5 Tablespoon Sea Salt & Freshly Ground Black Pepper 2 Tablespoons Fresh Dill With a box grater, grate the cucumber into a fine sieve nestled inside a small bowl. Refrigerate overnight, to drain as much as excess moisture as possible. In a large bowl, combine yogurt, garlic, 2 tablespoons oil, vinegar, salt & pepper. Cover mixture and refrigerate overnight. Stir the drained cucumber into the yogurt mixture and add 1 tablespoon fresh dill. Stir to combine. Drizzle with remaining oil and garnish with remaining dill. 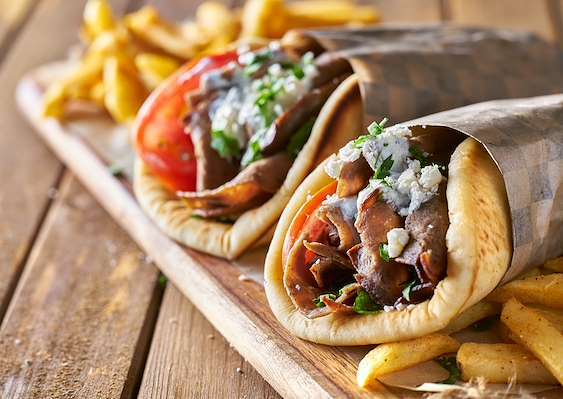 Have you often wanted to try to make gyros like your favorite Greek food cart does? This authentic recipe includes slices of homemade gryo meat layered with crisp veggies, olives and feta in a tender pita. They are easy to make and bring a taste of the Greek islands to your table. Instead of a boring tossed salad, give your greens a Greek-inspired flair with my simple & yummy salad recipe! It is a colorful medley of tomatoes, yellow bell peppers, briny olives and tangy feta, dressed in a tasty vinaigrette. 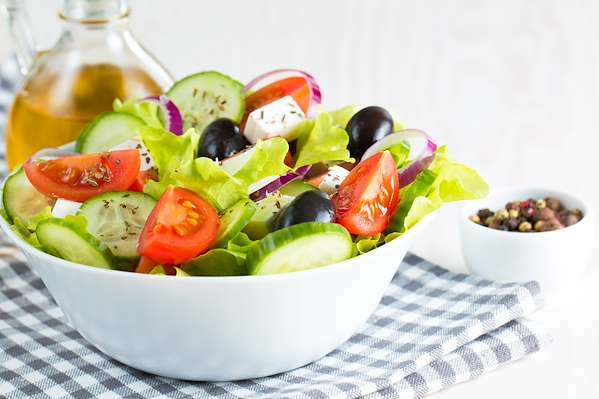 Serve this salad with your favorite Greek meal or toss in some protein to make it a quick lunch! 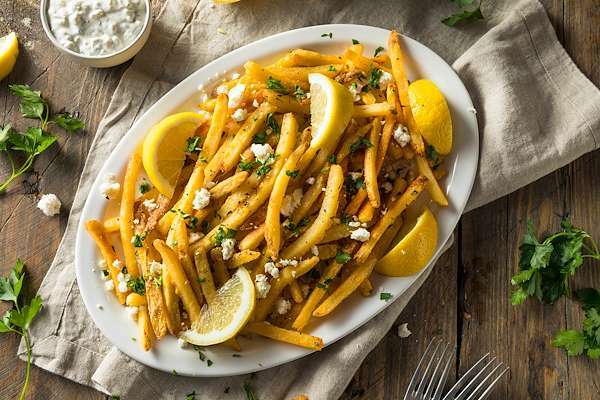 Baking fries gives them the golden crunch that you crave without the added fat of deep-frying. Try these Greek-inspired ones that are seasoned with aromatic herbs, tomatoes and tangy feta cheese. They bake up crispy and brown and are perfect with a side of tzatziki sauce. 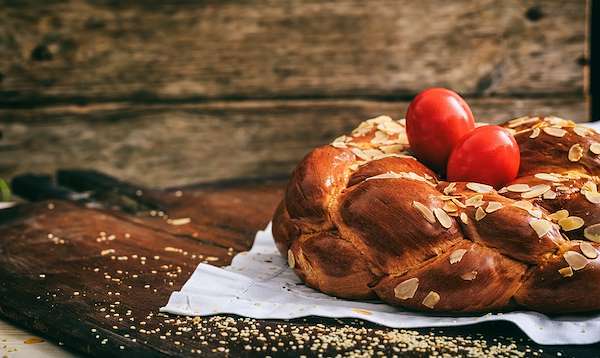 No Orthodox Easter brunch would be complete without the traditional Paskha loaf, which the Greeks call tsoureki. It is a delightful yeast bread that is infused with orange and mahlab, a Mediterranean spice derived from wild cherry pits. The dough is braided and gets a red egg in it before baking. Serve it with a sweet cream cheese spread.